As I mentioned in the previous post there are a lot of factors to consider when purchasing hosting for your website and email. Here I’ll walk you through the process of setting up what I expect will be the most common for folks just starting out. 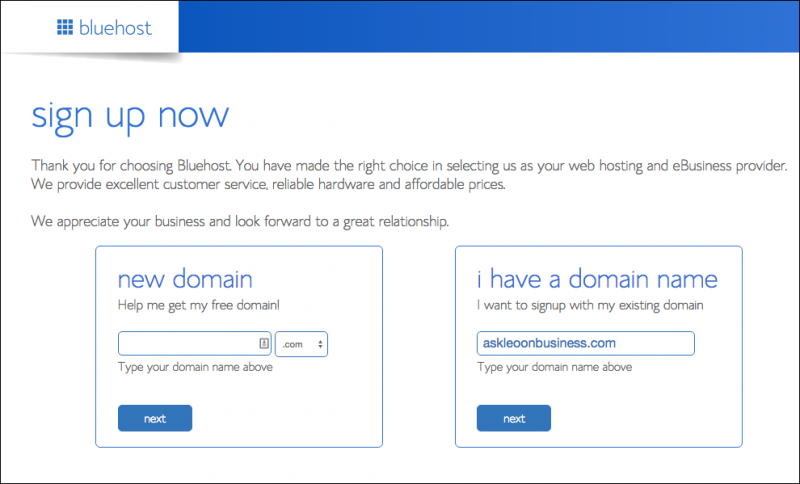 Today we’re going to purchase and set up basic hosting for askleoonbusiness.com at BlueHost. Go to BlueHost.com. Generally shared hosting is what they’ll feature by default, but just to be certain click on Products, and then Shared Hosting to make sure you’re on the page for that product. Towards the bottom of the page you’ll be presented with a list of different packages, for different monthly prices. websites: Quite literally the number of websites you can host under this plan. Personally I find the techniques to host multiple sites in a single plan rather confusing at times, and bundling them into a single plan isn’t always the right solution. We’ll be focusing on a single website here anyway, since that’s where most people start. website space: Unless you’re building an exceptionally large web site – perhaps with lots of audio and video you host yourself (as compared to, say, placing them on YouTube), or a very large number of photographs, these numbers are all plenty. bandwidth: this is here primarily for comparison against other hosting companies which often charge for the amount of data transferred in (uploaded to) or downloaded from (whic your site visitors do) your website. performance: It seems understandable that paying more would place your web site on higher performing hardware. Unless you know you’re going to have a particularly active website with high server load (hint: most people don’t), then this doesn’t matter much. 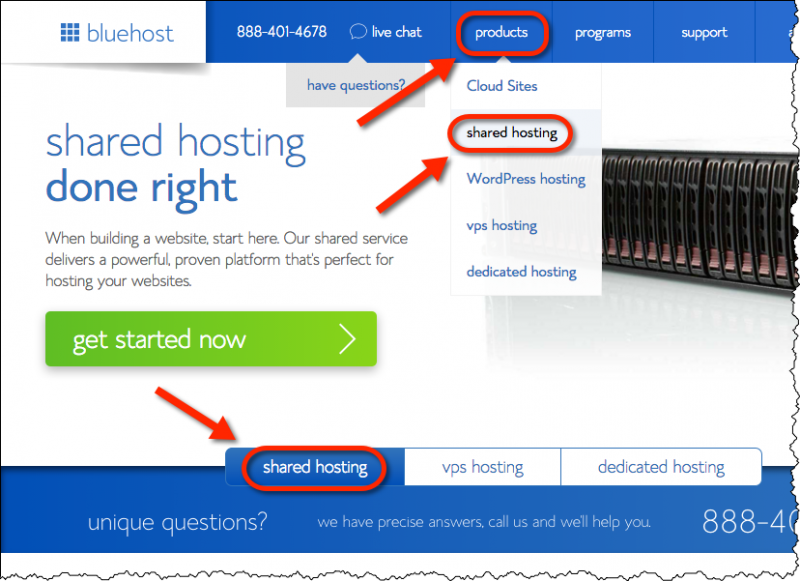 included domains: Recall in the previous post that I mentioned that Bluehost had become a web host that also happened to be a domain registrar. They include purchase of one domain when you sign up for any of their plans. Since we already own our domain this is irrelevant. parked domains: A parked domain, in Bluehost’s terminology, is another domain that points to the same web content as your primary domain. This isn’t something we’ll be discussing as it’s rarely needed. sub domains: This is perhaps best explained by the very example you’re looking at: “biz.askleo.com” is a subdomain of “askleo.com”. You’ll note that they are completely separate websites. These are nice to have available at times, but represent somewhat advanced usage. They’re not something you need to consider here today as we start out. email accounts: This represents the actual number of email accounts with mailboxes that are supported by the hosting plan. Note that you can still have additional email addresses that only forward to email accounts (for example sales@askleoonbusiness.com could forward to leo@askleoonbusiness.com – only the later might be an email account, the other would be a forwarder with no mailbox of its own). 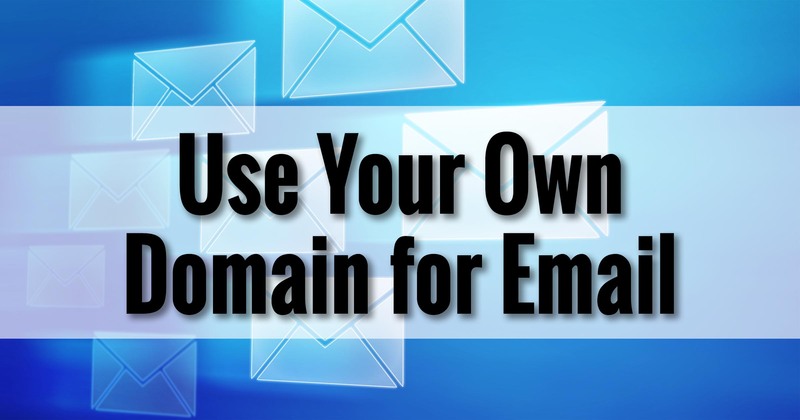 The number could be relevant depending on the number of individual email mailboxes you plan to use on your domain. This is a topic we haven’t covered yet, but to start the minimum here should be fine. email storage: This represents how much email can be stored in your mailbox on the server. Unfortunately with the rise of IMAP usage on mobile devices any limit seems somewhat small, however we’ll be covering ways to manage your email that make the smaller limit almost irrelevant in an upcoming post. Bottom line here: smallish is a fine place to start. marketing offers: Because we all want things marketed at us? What this really means is that a few additional features are included. They’re not features that are relevant when starting out, so once again, I’d not be concerned. As you might imagine from my descriptions above, in most cases the “Basic” plan is a fine place to start. Electing to get a new domain or specifying the domain you already own. The next step is to either get or specify the domain name we’ll be setting up. As I mentioned before, Bluehost will register a domain for you if it’s available, but since we’ve already purchased our own domain we’ll specify it instead. Type the domain name you own into the “i have a domain name” box, and click on next. This will take you to the account signup page where you specify your information, some choices about your purchase, as well as your billing information. 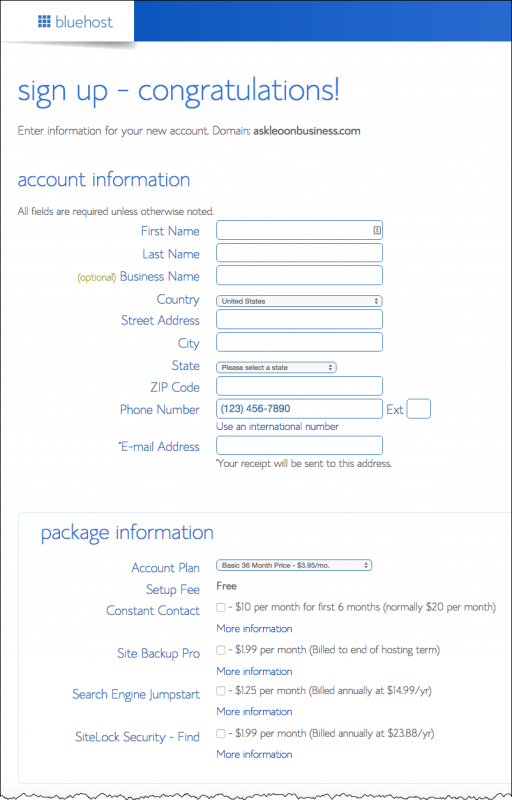 The Bluehost account signup page. There are a couple of very important things to watch for on this page (and pages like it at other hosting companies). First, you’ll notice that our nice low rate is the rate if we commit to three years of hosting. The price is different for shorter commitments. 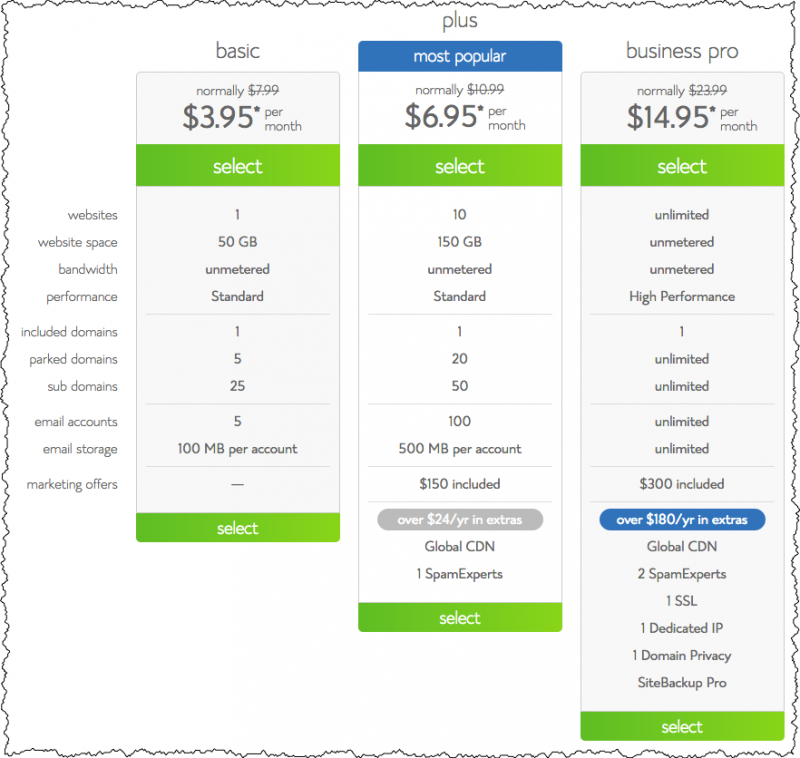 Bluehost plan and pricing selection. Make sure you make an informed decision on what’s appropriate for you. In my case I expect askleoonbusiness.com to be around for a while, so I’m electing to choose the 36 month commitment. Your needs may be different. Second, there are a number of additional add-on products listed, some of which may be selected by default. Bluehost additional services offered at signup time. Unless you know you need them (spoiler: you don’t), make sure all are unchecked. Fill in your credit card information (not shown above), click on the checkbox to confirm you’ve read their terms of service, and click on Submit. You may be given additional offers at this point. Decline or click on “no thanks“. We can always add services later if we decide we need them (spoiler: we probably won’t). You’ll now need to create a password for your hosting account. It’s to this account you will return periodically to make certain types of changes to your website, manage email accounts, upload files and more. Congratulations! 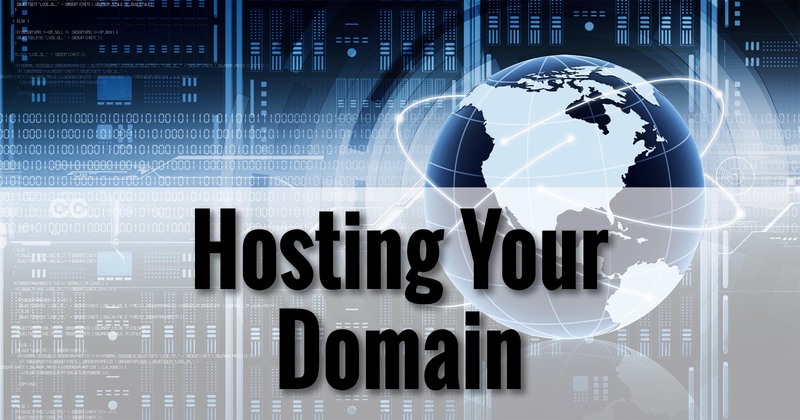 You have web hosting! 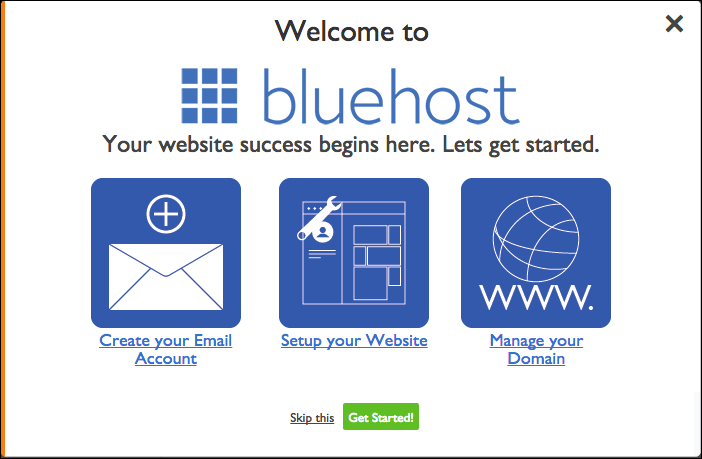 The Bluehost welcome banner and offer of next steps. You can click on Skip this. I’ll be walking you through the steps you’ll need to take next. 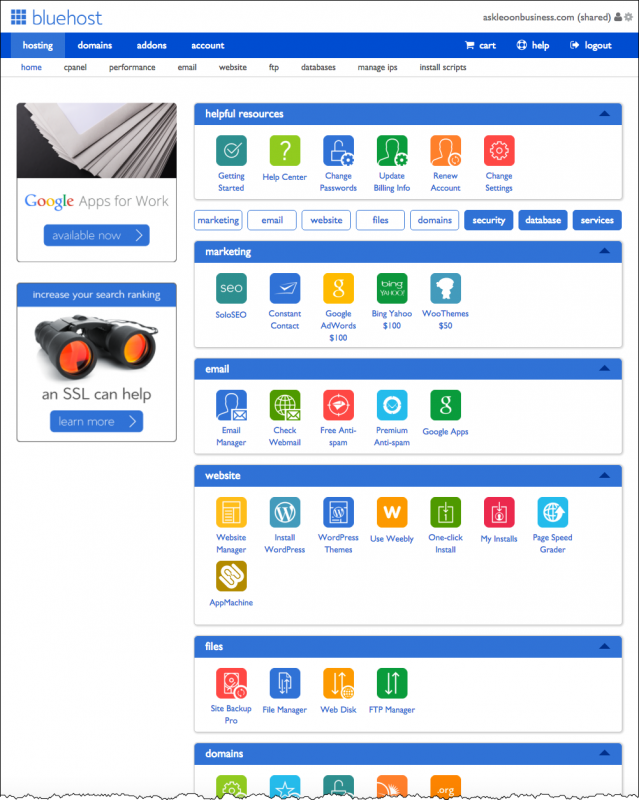 In the mean time, this is your home on Bluehost; the interface that you’ll use to manage the various and sundry aspects of your web hosting. Your home page on Bluehost. Before we finish today, there’s one last thing to do: making a connection. Right now if you actually go to your domain name, you’ll get a parking page provided by your registrar. In my case that’s SimpleURL. Domain names are human readable, but their intent is to point to a server on the internet. For example as I write this, the domain name askleo.com points to 50.28.23.175, which identifies a specific server. Right now your domain name points to a server back at your registrar. 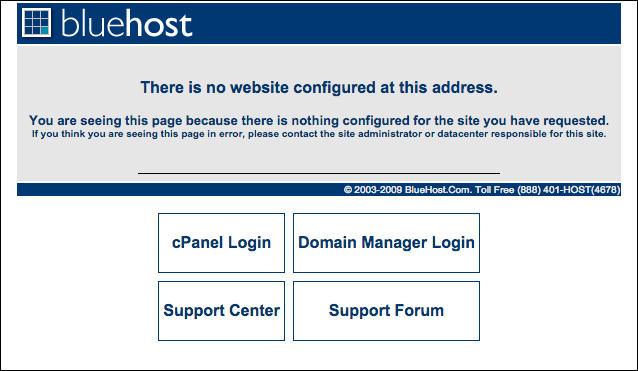 We now want it to point to the server housing our newly created Bluehost account. First we need to find out what that IP address is. In your Bluehost account, click on manage ips. The manage IPs link in the Bluehost interface. That’ll bring up a list of the IP addresses associated with your website. Bluehost showing your website’s IP address. Simply note your IP (it’ll probably be different than mine, shown above). Save that, we’ll be using it in a moment. Now, return to your registrar – SimpleURL in our case – and login to the account you created there when you purchased your domain. The Log into account link at SimpleURL. On the resulting page (not shown) click on the Domain Manager button. This will give you a list of the domains that you own, including, or perhaps only, the domain you recently purchased. Your domain listed at SimpleURL. Click on the Control Panel button next to your domain. That’ll present a long list of information associated with your domain. The only thing we care about today is under “DNS / URL Forwarding”. Click Edit DNS Hosts. Editing host records at SimpleURL. We’re going to change the two lines we see there. In each line click on the dropdown next to the word “URL Frame”, and click “A (IP address)”, And then replace the contents of the address field with the IP address we saved from Bluehost. IP addresses specified in the SimpleURL edit interface. Click Update Host Records and you’re done! Whew! That was a lot! 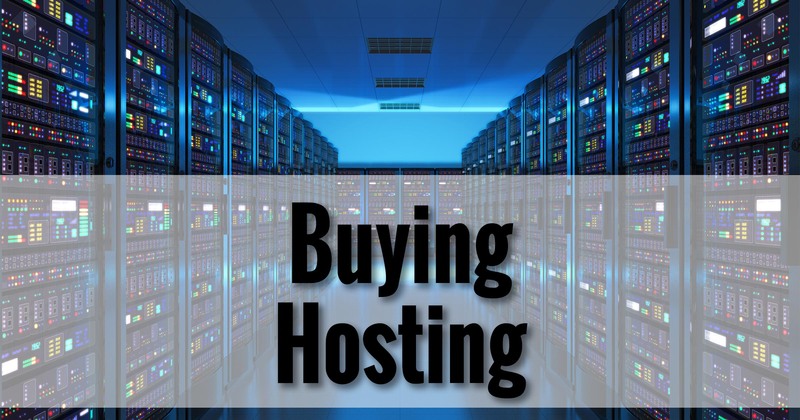 Purchase and set up hosting – a server to be the home for our web site. 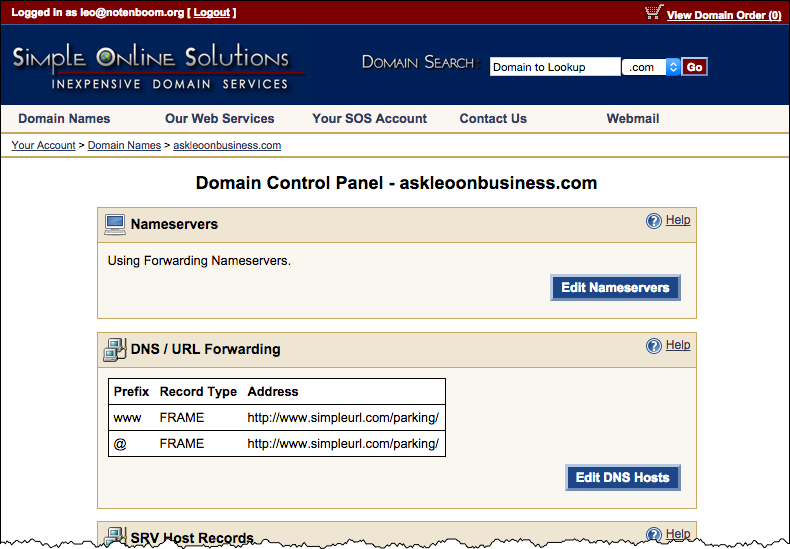 Point our domain name – askleoonbusiness.com in my case – to that server. Next up: we’re actually going to put the website itself on the back burner for a moment. Instead, we’re going to set up your email address on your own domain. That way your email communications can start looking their best, right away. Maybe I didn’t read the hosting info completely, but I don’t see a plan where you can have an on-line store with the service you’ve shown. Do you recommend a hosting site that does allow you to sell items? You can sell items via almost any web host. It’s not about the host, but about the software you choose to implement your site. I have always used name servers to forward my domains. Is there any advantage to using forwarding instead? Unfortunately the terminology you’re using is actually ambiguous … can you elaborate on exactly what you’re doing? In your example above, I would not “Edit DNS Hosts” but instead “Edit Nameservers” to include my hosting company’s DNS servers (in my case NS1.ASOSHARED.COM and NS2.ASOSHARED.COM). It seems to accomplish the same thing, or are there other considerations? All you’re doing is specifying that the DNS is handled by ASOSHARED.COM instead of yoru registrar. That works just fine (I do it myself – most of my SimpleURL-registered domains actually have their DNS handled by Amazon Web Services) but it’s beyond the needs of most folks. Does everything you’ve said apply to me living in France, or would it be better to find a more local host? You know, that’s a very good question. I think I would probably tend to locate a local host, particularly if your audience is in France. If your audience is elsewhere, I’d be tempted to go more global, or more local to your them. Is there an advantage to using a separate name registrar such as SimpleURL? For example, if your domain name is important and you want to cancel your hosting contract and move your site elsewhere is this easier or safer with a separate registrar? I am in the UK, but I assume that .com registrars are mainly in the USA. However, I may wish to find a UK based hosting company. The advantage is that you can change your hosting more easily without needing to mess around with changing your registrar. For example Ask Leo! has been on at least three different hosts (maybe more 🙂 ) over the last 13 years. But with the same registrar since day 1. If you have your host also do your registration then you have two options when you move: continue your relationship with the first host to keep the registration, or move the registration. Moving registration can be done, but it’s a somewhat cumbersome process with checks and delays in place to prevent fraud.